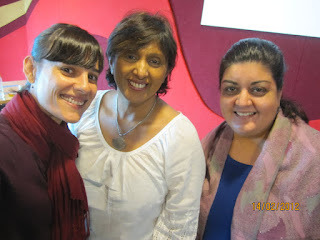 AWL's inaugral radio slot on Wednesday, (15th of February, 2012) 11am - 12noon hosted by well-known celebrity, Ms Asha Gill, went amazingly well and made a strong impact on its listeners. Our AWL President, Ms Meera Samanther, displayed good chemistry whilst bantering with AWL anchor Ms Sheena Gurbakhash. They opened the show with an introduction of AWL and what its missions were. Their aim was to demystify the law so as to be able reach to as many listeners as possible .They discussed what law is and also explained the concept of equality in law by differentiating the concept of formal equality from substantive equality using the framework of CEDAW ( Convention on the Elimination of All forms of Discrimination Against Women) . They ended with explaining the importance of every individual needing to know the value of law as it affects every one of us in our daily lives and that the public can also get involved in shaping the law. Next week the discussion will be on contract law and the famous Carbolic Smoke Ball case. The following week, at the request of the producers of the show, a discussion on Sexual Harassment and the impact on women will be aired and discussed by our very own President , Meera Samanther and Betty Yeoh of AWAM (All Womens Action Society). AWL will be having regular slots with Asha Gill every Wednesday between 11 - 12 midday .